Atopic dermatitis is a diagnosis of exclusion. 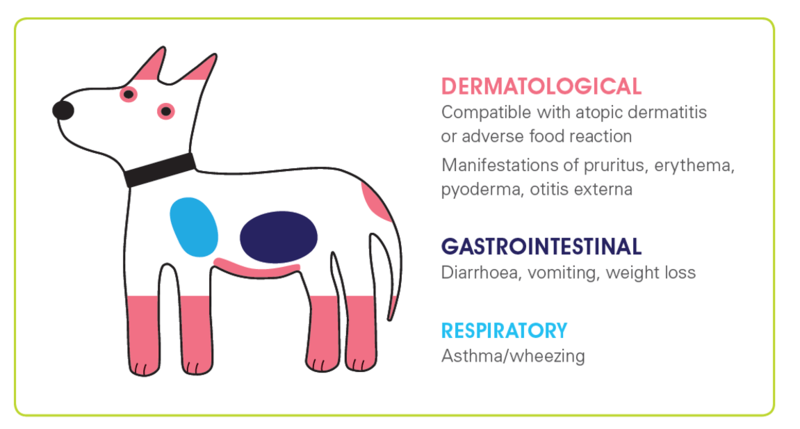 With this in mind, the allergy toolkit was created to help systematically rule out common causes of pruritus in dogs and cats, and thus complement the food and environmental testing for which Avacta Animal Health is known and trusted. 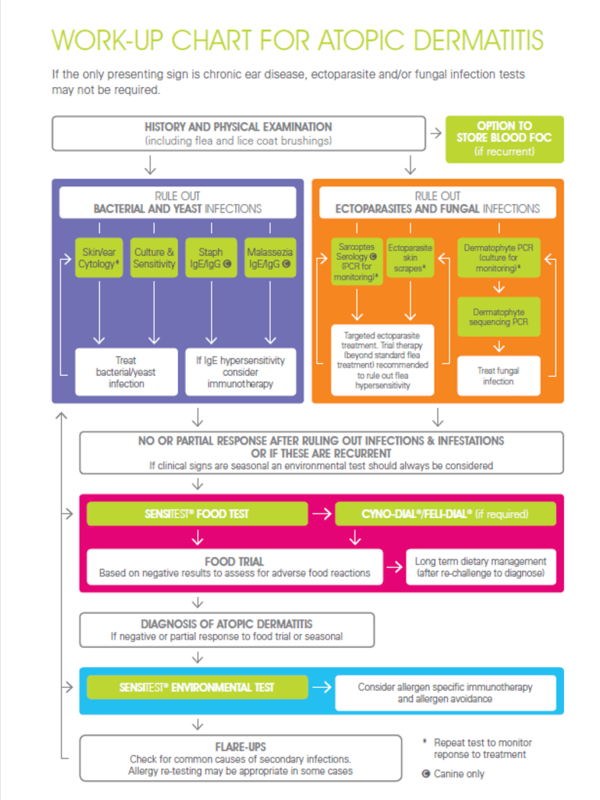 The flowchart below shows the complete toolkit now being offered. Designed to be completely flexible to the needs of different veterinary professionals, it enables a comprehensive work-up to be carried out, testing for; bacterial and yeast infections, ectoparasites and fungal infections, food and environmental allergy. Alternatively, a specific section or individual test can be selected dependent on case requirements. Our detailed results pack has been devised to make test interpretation simple and clear. It includes client friendly versions of the results, with bespoke microscopy images from their own pet where possible, aiding their understanding and thus supporting enhanced treatment compliance. A PDF version of the work-up chart can be downloaded HERE. It is suggested that 10-15% of dogs in the UK are affected by allergic disease, and it is being recognised with increasing frequency in cats. Consequently, there is a huge demand for aids in diagnosis. Allergy can manifest itself in a wide range of clinical signs. Those most commonly seen in companion animals are shown in the diagram below. 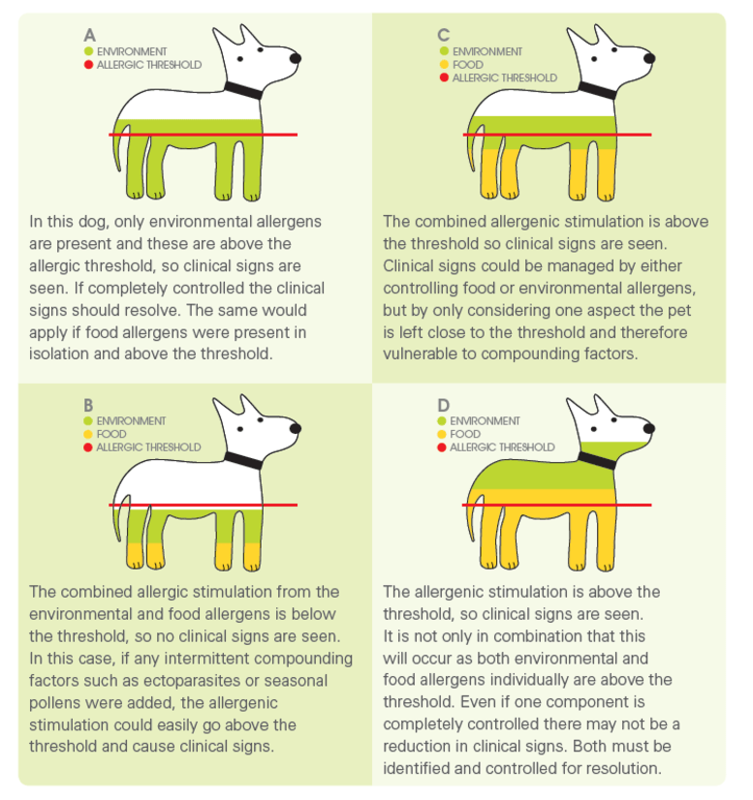 The concept of an individual animal having an allergic threshold above which clinical signs are seen, has been long established. However, there is now a greater understanding that the allergens contributing to the build-up are often multifactorial.